Garden trellises that will last for years. Available for any size planter. L-shaped trellis and planter box. Trellises support climbing plants such as beans and peas, flowering vines and tomatoes. A well-placed trellis increases growing space and improves access to light and air circulation. Fruits and vegetables on trellises are easier to reach and less vulnerable to pests and diseases. Garden trellises assemble in panels that attach securely to the tops of planters, along fences, or the sides of houses. Trellises can be used as free-standing privacy screens and garden patio dividers. The flexible panel design allows for an endless variety of shapes and sizes. Compared with most wood trellises, our trellises are exceptionally durable. The trellis panels are well-constructed from very strong cedar that will last for years, supporting heavy vines, fruits and vegetables. Trellises can be moved from one planter to another, or taken down and stored with the season. Garden trellises, like our planter boxes and raised beds, are covered by 30-day money back guarantee and 10 year limited warranty. 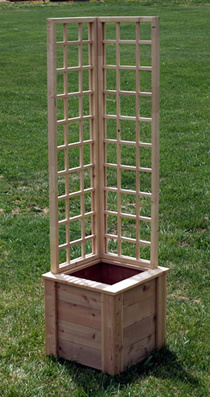 Garden trellises are available to fit any size planter. Please call for help finding the perfect trellis. Basic trellises are available in framed and unframed panels that can be used alone or in combination to make endless shapes. A-frame trellises offer tool-free installation and great flexibilty to support everything from tall pole beans, to sprawling cucumbers, heavy melons and squash. L-shaped trellises provide vertical support at the corners of planter boxes and raised beds. U-shaped trellises come in three and five panel assemblies to fit square, rectangle, hexagon and octagon beds. They come with the necessary posts and braces, and attach with screws to the tops of planters. In addition to the sizes below, custom trellis designs are also available. To order, please call 1-800-807-3404 (the shopping cart feature is not available at this time). Wall mount trellises come with hardware to attach to fences and the sides of houses. A-frame trellises are hinged at the top and adjustable to fit any size planter, and can be used on the ground, free-standing. L-shaped trellises for square and rectangular planters. Call for more options. Actual size refers to the assembled trellis only and does not include planter. Single wall trellises for square and rectangular planters. Call for more options. U-shaped trellises for square and rectangular planters. Call for more options. L-shaped trellises for L-shaped planters. Call for more options. U-shaped trellises for U-shaped planters. Call for more options.